Traditionally, the term “bread processing” was used by high-speed bakers to assess the contribution of moulding or makeup stages of dough to the manufacture of bread. 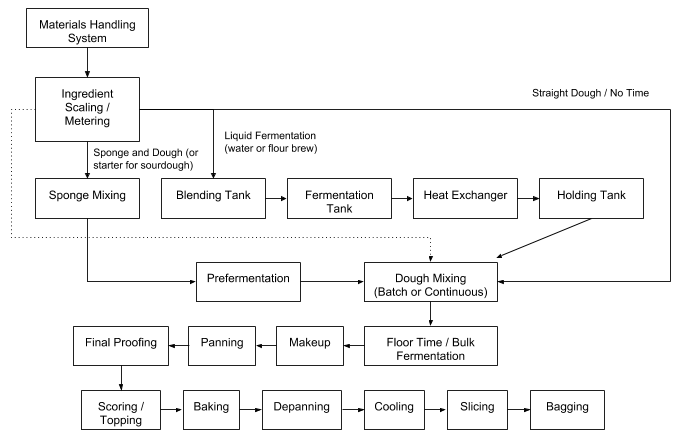 The following block diagram shows the production steps in bread processing using different dough systems. The style and type of bread dictates the dough system to use as well as the processing conditions during mixing, makeup and baking. A baker would not like to produce ciabatta with a close crumb structure, or to produce a loaf of white pan bread with an open crumb structure and texture like a ciabatta. All steps in bread processing are important for a successful operation, but most bakers would agree that the three truly vital process steps are mixing, fermentation and baking. 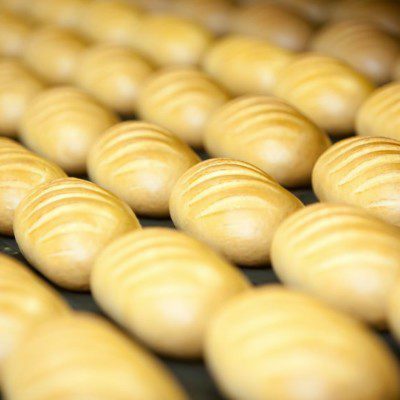 They are commonly described as the heart and cornerstone of breadmaking operation and can also determine the finished product characteristics, both internally and externally. Mixing time: a function of flour strength, its protein, damaged starch and non-starch polysaccharides and bran particles content. Other factors include mixer speed, mixing arm design, dough size in relation to mixer capacity, adequacy of refrigeration system (dough temperature) and delayed sugar/fat/salt addition. Mixing equipment: vertical (planetary), spiral (open and closed for vacuum mixing), horizontal, continuous (open and closed). Fermentation time: controlled by the temperature of dough, sponge, starter or pre-ferment, hydration level (free water), pH, osmotic pressure, yeast food (amino acids, minerals, fermentable sugars) and yeast level (or lactic acid bacteria count). Fermentation equipment: troughs in fermentation room, closed tanks, open tanks, benches. The divider cuts bulk dough into single pieces of proper weight (with as little stress exerted on dough as possible) so that these can be rounded and rested prior to taking their final shape. The divider must process the entire dough load quickly to prevent excessive gassing that creates scaling errors. The sheeter and moulder encompass the sheeting stage, curling chain, pressure board, and guide bars. These influence the gas bubble structure, shape and length of the dough piece to place in the pan.The moulder should be adjusted to achieve the desired shape with a minimum amount of pressure and stress on the dough to avoid damaging cell structure obtained during mixing and fermentation. The objective is to convert raw dough into bread, set structure of product, crust and crumb formation, kill-step and shelf-life extension. Variables to monitor and control include temperature, time (governed in continuous ovens by conveying speed). Other relevant variables include heat flux (burners), humidity (dampers) and air velocity or flow. Baking time: controlled by oven temperature, conveying speed, initial (proofed dough) and final product temperature, heating pattern, bake loss, product load and formulation. Baking equipment: direct-fired oven, indirect-fired oven, electric oven, rack oven, reel oven, conveyorized, tunnel, hybrid and impingement oven. Zhou, W. Bakery Products Science and Technology, 2nd edition, John Wiley & Sons, Ltd, 2014, pp. 475–507. Cauvain, S.P. Technology of Breadmaking, 3rd edition, Springer International Publishing Switzerland, 2015, pp. 147–212.